Michelle Kierce is an insurance coverage attorney at Betts, Patterson & Mines P.S. Michelle’s practice is focused on the representation of insurance companies in coverage and extra-contractual matters, including defending claims of bad faith, breach of contract, negligence, and violations of the Consumer Protection Act and Insurance Fair Conduct Act. In addition to coverage litigation, Michelle routinely advises companies on risk and claims with respect to all types of commercial insurance, including general, professional, and employment practices liability, business and commercial property, and worker’s compensation policies. Michelle also has experience with homeowner and personal automobile insurance coverage matters. 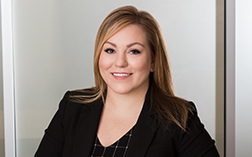 Prior to joining Betts, Patterson & Mines, Michelle represented individuals and companies of all sizes, primarily in the construction industry, in a variety of business, contract and employment matters.